Cross-border e-commerce is a phenomenon that has quietly gained huge momentum as customers purchase products from outside their borders. Sweden online shoppers feel reassured about buying items from UK websites, they’re more likely to make the purchase. Free international returns are the key reason that would encourage buyers to shop more, closely followed by a low price for international delivery. Free international returns are ranked as the top reason for shopping online from UK websites at a rate of 33%. Lowest international delivery price comes at next as a motivating factor to shop online from the UK with a rate of 32%. 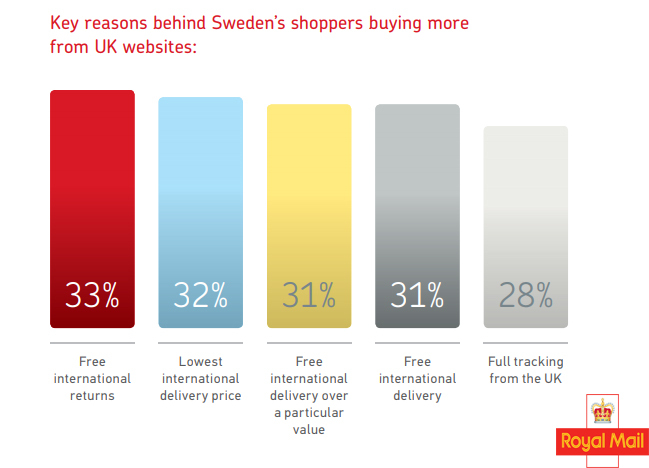 Free International delivery over a particular value is a Sweden online shoppers reasons to shop online from the UK with a rate of 31%. A Graph Shows Sweden Online Shoppers Motivating Factors to Shop Online From UK Website, 2017. Royal Mail is a postal service and courier company in the United Kingdom, originally established in 1516. The company's subsidiary, Royal Mail Group Limited, operates the brands Royal Mail (letters) and Parcel force Worldwide. The company provides mail collection and delivery services throughout the UK. Letters are deposited in a pillar or wall box, taken to a post office, or collected in bulk from businesses. Royal Mail connect companies, customers and communities across the UK, delivering a ‘one-price-goes-anywhere’ universal postal service to over 29 million addresses. As one of the UK's leading companies, that focus on being recognized as the best delivery company in the UK and across Europe.